Background: Diabetes mellitus (DM) is an endocrinal disorder characterized by chronic hyperglycemia. Managing DM without side effects is a challenge till date that attracts researchers toward plant-based new products. In some studies, seeds of Syzygium cumini were found to have anti-diabetic and anti-hyperlipidemic properties, attributed to saponins, glycosides, and flavonoids. Hence, it should be further explored for its benefits. Aims and Objectives: To study the effect of jamun seed powder on glycemic control in type 2 DM. Materials and Methods: Patients with type 2 DM and uncontrolled blood sugar (n = 99) were randomly divided into two groups - Group A (n = 50) was supplemented with 10 g/day jamun seed powder and Group B (n = 49) was given placebo powder. Oral hypoglycemic agents (OHAs) were continued as before. Patients and investigators were blinded about the treatment allocated. Fasting plasma glucose (F.P.G.) and post-prandial plasma (P.P.) glucose were noted at baseline and 30th, 60th, and 90th day and HbA1c on 0 and 90th day. Observations and Results: In Group A, F.P.G. decreased by 9%, 18%, and 30% and P.P. glucose by 8%, 15%, and 22% after 30, 60, and 90 days, respectively. In Group B, F.P.G. increased by 3% and P.P. glucose by 2% after 90 days. HbA1c in Group A reduced from 8.99 ± 1.39% to 8.31 ± 1.40% on 90th day (P < 0.05), while a nonsignificant rise from 8.70 ± 1.17% to 9.03 ± 1.31% was noted in Group B. Conclusion: Supplementation with jamun seed powder improves glycemic control significantly in type 2 DM with poorly controlled glycemic levels on diet and OHA. 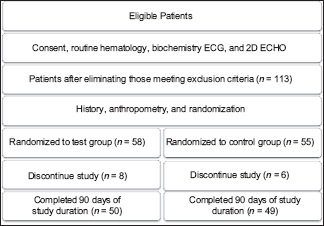 However, before recommendation, multicentric trial with larger sample size, dose, and duration should be planned. Diabetes mellitus (DM) is a common endocrinal disorder of carbohydrate, fat, and protein metabolism. It is characterized by chronic hyperglycemia due to relative insulin deficiency, resistance, or both. Hyperglycemia in DM leads to vascular complications, which is the major cause of morbidity and mortality in diabetic patients. Side effects of insulin and oral hypoglycemic have increased the popularity of traditional and complimentary medicines. Seeds of Syzygium cumini were found to have anti-diabetic, anti-inflammatory, and anti-dyslipidemic activities,, attributed to its saponins, tannins, and flavonoids.,, Jamun seed powder should be explored as an easily available, cheap alternative to currently available drugs that decrease complications; leading to decrease in health care and economical burden on family, society, and nation. To study the effect of S. cumini supplementation on blood glucose in patients with type 2 DM. The study was conducted over a period of 1 year from November 2014 to November 2015. The study design was single-centered, double-blind, randomized controlled parallel-designed trial. The study was carried out in accordance with the Declaration of Helsinki (2000) of the World Medical Association and approved by the Local Medical Ethics Committee. Informed consent was obtained from all participants. The study was conducted on a total of 99 patients with type 2 DM with poorly controlled blood sugar levels, fasting plasma glucose (F.P.G.) >126 mg/dl, and postprandial blood sugar >180 mg/dl during continued treatment with oral hypoglycemic agents (OHAs). Patients with cardiovascular, cerebrovascular, liver disease, or renal failure were excluded from the study to avoid any unknown serious side effects. Patients with sepsis, malignancy, or terminally ill patients were also excluded from the study to avoid unforeseen adverse effects. Pregnant patients with diabetes were also excluded from the study to avoid, if any, harmful effects on fetus. Patients taking insulin for glycemic control were excluded from the study as there are chances of self-monitoring and change in the dose of insulin according to glycemic levels and thus hindering the study results. Before enrollment, details about the nature and utility of the study were explained to all patients and informed consent was obtained. Group B (control group): Type 2 DM patients received placebo. Patients in test group were given S. cumini seed powder at a dose of 5 g twice daily before meal, a total of 10 g/day, and participants in control group were given placebo powder without having any hypoglycemic effect or effect on dyslipidemia. Anti-diabetic medications were continued as same. Baseline F.P.G., post-prandial plasma (P.P.) glucose, and HbA1c levels were noted. F.P.G. and P.P. blood sugar were repeated on 30th, 60th, 90th day, and HbA1c on 90th day. Patients and all investigators were blinded to the treatment assigned throughout the study. Patients were advised to report any adverse reactions to treating physician in charge of patients. Treatment allocated was enclosed in a sealed envelope to which physician in charge of patients had access to only in case of an emergency. Data were analyzed using one-way anova through INDOSTAT statistical software version 8.1 for Windows (INDOSTAT, Hyderabad, India). Paired and unpaired Student's t-tests were performed to assess the significance among test groups and between test group and control group using MSAT Software version 6.2.1 for Windows (University of Winconsin, Madison, USA). As shown in [Table 1], baseline mean F.P.G. in test group was 143 ± 13.42 mg/dl and in control group it was 141 ± 9.44 mg/dl. F.P.G. decreased by 9.16%, 18.18%, and 30% after 30, 60, and 90 days of supplementation with S. cumini seed powder in test group, which was statistically significant. The mean F.P.G. levels of the diabetic patients in the control group increased by 2.83% after 90 days of the study period. It can be observed from [Table 2] that baseline mean post-P.P. glucose level of test group was 242 ± 29.06 mg/dl which reduced significantly to 225 ± 30.18 mg/dl, 211 ± 31.42 mg/dl, and 199 ± 29.92 mg/dl after 30, 60, and 90 days, respectively. Calculated critical difference for test group was 11.89 mg/dl which was achieved after 30 days of supplementation. In control group, post-P.P. glucose raised by 2.16% from 232 ± 27.77 mg/dl to 237 ± 24.77 mg/dl after 90 days. Post-P.P. glucose level of the two groups did not differ from each other during the start of the study (P = 0.085); however after 60 days, both groups differ significantly from each other (P = 0.001). As shown in [Table 3], mean HbA1c of patients in test group was 8.99% ±1.39% which was reduced to 8.31% ±1.40% after 90 days. However, mean HbA1c of control group increased from 8.70% ±1.17% to 9.03% ±1.31% after 90 days. This reduction in HbA1c after supplementation with S. cumini seed powder in test group was statistically significant (P < 0.05). However, mean HbA1c of control group increased from 8.70% ±1.17% to 9.03% ±1.31% after 90 days. Managing diabetes to delay its complications is a challenge. Persistent hyperglycemia in patients with diabetes contributes to the development of various complications through various mechanisms; by increasing free radical generation leading to oxidative stress, production of advanced glycosylation end products causing protein cross-linking, and accelerated atherosclerosis and altered transcription of genes of various proteins such as fibronectin, type IV collagen, contractile proteins, and extracellular matrix proteins in endothelial cells and neurons. Thus, glycemic control is a major target of the management of diabetes to prevent and/or delay complications of diabetes. There are many therapeutic options available for the management of diabetes, which include oral hypoglycemic drugs and insulin therapy. However, none of the available therapeutic option is available which effectively controls diabetes without side effects. Many patients with diabetes in the modern world have choice for alternative medicines for controlling diabetes. Ayurveda and ancient literature recommend many herbal medications for control of diabetes, only few of which are yet studied scientifically to find the effectiveness for control of glycemic levels and thereafter active component present in them. In our study, we found the effective role of S. cumini in lowering blood glucose levels in type 2 DM patients with poor glycemic control on OHAs. Mean F.P.G. levels reduced from 143 ± 13.42 mg/dl to 131 ± 14.97 mg/dl, 121 ± 15.14 mg/dl, and 110 ± 15.49 mg/dl and after 30, 60, and 90 days of supplementation with S. cumini seed powder which was a statistically significant reduction by 9.16%, 18.18%, and 30%, respectively. The findings of the present study are in concurrence with the study by Jeyaraj who observed a statistically significant reduction (P < 0.001) by 10.6% in the mean F.P.G. levels of the diabetic patients after 60 days of jamun seed powder supplementation from 155.4 ± 23.5 mg/dl on day 0 to 138.8 ± 26.6 mg/dl on 61st day. Similar results were found by Virmani et al. during their study at All India Institute of Medical Sciences, New Delhi, on patients of type 2 DM after giving 10 g of jamun seed for 4 weeks. They noticed 6.99% reduction in F.P.G. levels which was statistically significant over 1.68% reduction in control group managed by diet and exercise regimen. Results in this study are comparable to our study in which we observed 9.16% reduction in mean F.P.G. after 30 days of S. cumini seed powder supplementation. During their study, Sahana et al. noticed a significant reduction in mean F.P.G. from baseline of 152.0 ± 22.5 mg/dl to 140.7 ± 6.6 mg/dl (P = 0.016) at the 3rd month and to 134.0 ± 21.3 mg/dl (P = 0.043) at the 6th month, Percentage reduction of F.P.G. levels at 3rd and 6th month was 7.4% and 11.8%, respectively. Effectiveness of jamun seed powder in significantly lowering blood glucose levels was also observed by studies done by Helmstädter and Srivastava et al. Results in our study are in contrast to a study done by Moses, he noticed statistically nonsignificant reduction (P > 0.05) in mean F.P.G. of patients from baseline value of 138.7 mg/dl to 123.7 mg/dl and 132.8 mg/dl after 45 and 90 days of supplementation, respectively, with jamun seed powder at a dose of 0.6 g/day. In our study, we used S. cumini seed powder at a dose of 10 g/day, but the dose used in the study by Moses was 0.6 g/day, which was less than that used in our study and may be an ineffective dose to produce therapeutic effects. Another reason for difference in results may be due to difference in sample size (99 vs. 40), or due to difference in race, ethnicity, and other characteristics of the study population. In our study, we found statistically significant reduction in mean post-P.P. glucose level from baseline 242 ± 29.06 mg/dl to 225 ± 30.18 mg/dl, 211 ± 31.42 mg/dl, and 199 ± 29.92 mg/dl after 30, 60, and 90 days of supplementation, respectively, with S. cumini seed powder. Similar results were obtained by Moses, who noticed decrease in post-P.P. glucose levels from baseline of 235.7 mg/dl to 200 mg/dl and 189.1 mg/dl after 45 and 90 days, respectively, after supplementation with jamun seed powder. During their study, Virmani et al. noticed 10.56% reduction in mean P.P. blood glucose level after 28 days of supplementation with jamun seed powder which was statistically significant over 5.21% reduction in control group managed with diet and exercise alone. Similar results were obtained by Srivastava et al. in 1983 during their study on 28 diabetic patients. Later, Kohli and Singh in 1993 also observed significant hypoglycemic effect after administering 12 g of jamun seed powder in three divided doses for 3 months to thirty patients of noninsulin-dependent diabetes mellitus. In contrast to our results, study by Sahana et al. after giving 10 g of jamun seed powder to 15 subjects for 90 days found that there was no significant reduction in average P.P. blood glucose levels from baseline of 218.9 ± 87.2 mg/dl to 219.6 ± 56.2 mg/dl (P = 0.754) at 3rd month and 202.9 ± 43.8 mg/dl (P = 0.424) at 6th month. Difference in results may be due to difference in sample size (99 vs. 15); other reasons of difference can be due to ethnic differences in the study populations. In addition to the above results, we observed in our study that there was decrease in HbA1c from baseline value of mean 8.99% ±1.39% to 8.31% ±1.40%, an absolute reduction of 0.68% after 90 days of supplementation with S. cumini seed powder, which was statistically significant, signifying long-term effectiveness of continued use of S. cumini seed powder. In another study by Sahana et al., the level of HbA1c reduced from an average of 8% ±1.3% to 7.6% ±0.7% at the end of 9 months which was statistically nonsignificant (P = 0.233). Conflicting results in both studies may be due to difference in sample size which was 15 in the study by Sahana et al. and 50 in our study. Since significant reduction in F.P.G. was noticed in both studies, P.P. blood glucose reduced significantly in our study but not in the study by Sahana et al., but a significant improvement in HOMA-IR from 10.3% ±4.7% to 6.5% ±4.1% (P = 0.027) after the 3rd month was noticed by Sahana et al. which signifies improvement in insulin resistance and thus glycemic control. S. cumini seed extract is composed of many phytochemicals, such as triterpenoids, anthocyanins, oleic acid, essential oils, glycosides, saponins, and several members of the flavonoids (e.g., rutin, quercetin, myricetin, and myricitrin).,,, Hence, the observed anti-diabetic effects of S. cumini seed extract may be due to a single component or a combination of these components that could have direct or indirect effects on insulin resistance and β-cell function. Proposed mechanism for improvement in blood sugar during various preclinical studies is that jamun stimulates the secretion of pancreatic insulin. Jamun administration is reported to restore the architecture of the pancreatic β-cell in diabetic experimental animal cells.,, Other studies have shown that jamun seed powder alters the activity of many enzymes involved in carbohydrate metabolism and glucose homeostasis. It has inhibitory activity on α-amylase, sucrase, and α-glucosidase; enzymes involved in carbohydrate metabolism, while improvement in the activity of glucose-6-phosphatase, hexokinase; enzymes involved in glucose homeostasis, was noted.S. cumini seed powder is found to upregulate the peroxisome proliferator-activated receptors, which might attribute to its anti-diabetic properties. Results of the present study signify the hypoglycemic effects of S. cumini seed powder. Thus, it may emerge as potential candidate drug for effective control of blood sugar levels in patients of type 2 DM and play a role in reducing morbidity and mortality associated with diabetes. Being cost-effective, it may help in improving biochemical parameters of diabetic patients in rural population. Karthic K, Kirthiram KS, Sadasivam S, Thayumanavan B. Identification of alpha amylase inhibitors from Syzygium cumini Linn seeds. Indian J Exp Biol 2008;46:677-80. Bhatia IS, Bajaj KL. Chemical constituents of the seeds and bark of Syzygium cumini. Planta Med 1975;28:346-52. Ravi K, Ramachandran B, Subramanian S. Effect of Eugenia jambolana seed kernel on antioxidant defense system in streptozotocin-induced diabetes in rats. Life Sci 2004;75:2717-31. Kumar A, Ilavarasan R, Jayachandran T, Deecaraman M, Kumar RM, Aravindan P, et al. Anti-inflammatory activity of Syzygium cumini seed. Afr J Biotechnol 2008;7:8. Siddiqui MS, Sharma B, Ram G. Anti-hyperglycemic and anti-hyperlipidemia effects of Syzygium cumini seed in alloxan induced diabetes mellitus in Swiss Albino Mice (Mus musculus). Med Aromat Plants 2014;3:4. Kasper D, Fauci A, Hauser S, Longo D, Jameson J, Loscalzo J. Harrison's Principles of Internal Medicine. 19th ed. New York: McGraw Hill; 2015. p. 2424. Jeyaraj S. Effect of jamun seed powder supplementation on the body mass index and fasting plasma glucose levels in woman with type 2 diabetes mellitus. Panacea J Health Sci 2012;3:16-20. Sidana S, Singh VB, Meena BL, Beniwal S, Singh K, Singla R, et al. Effect of Syzygium cumini (Jamun) Supplementation on Blood Glucose and Lipid Profile in NIDDM. Available from: http://www.japi.org/january2001/23rd_Jan_poster.htm. [Last accessed on 2016 Jan 18]. Sahana DA, Shivaprakash G, Baliga R, Adhikari Prabha MR, Ganesh J, Pai MR. Effect of Eugenia jambolana on plasma glucose, insulin sensitivity and HDL-C levels: Preliminary results of a randomized clinical trial. J Pharm Res 2010;3:1268-70. Helmstädter A. Syzygium cumini (L.) SKEELS (Myrtaceae) against diabetes – 125 years of research. Pharmazie 2008;63:91-101. Srivastava Y, Venkatakrishna-Bhatt H, Gupta OP, Gupta PS. Hypoglycemia induced by Syzygium cumini Linn. seeds in diabetes mellitus. Asian Med J (Japan) 1983;26:489-91. Moses CR. Clinical assessment of jamun (Syzygium cumini) seed powder and syrup on selected type 2 diabetes mellitus and hypercholesterolaemics. RSSDI 2013;8-10:119-20. Kohli KR, Singh RH. A clinical trial of jambu (Eugenia jambolana) in non-insulin dependent diabetes mellitus. J Res Ayurveda Sidda 1993;13:89-97. Ramya S, Neethirajan K, Jayakumararaj R. Profile of bioactive compounds in Syzygium cumini – A review. J Pharm Res 2012;5:4548-53. Sharma SB, Rajpoot R, Nasir A, Prabhu KM, Murthy PS. Ameliorative effect of active principle isolated from seeds of Eugenia jambolana on carbohydrate metabolism in experimental diabetes. Evid Based Complement Alternat Med 2011;789871:1-9. Singh N, Gupta M. Effects of ethanolic extract of Syzygium cumini (Linn) seed powder on pancreatic islets of alloxan diabetic rats. Indian J Exp Biol 2007;45:861-7. Sharma B, Balomajumder C, Roy P. Hypoglycemic and hypolipidemic effects of flavonoid rich extract from Eugenia jambolana seeds on streptozotocin induced diabetic rats. Food Chem Toxicol 2008;46:2376-83. Ahmed F, Chandra J, Timmaiah NV. Anin vitro study on the inhibitory activities of Eugenia jambolana seeds against carbohydrate hydrolyzing enzymes. J Young Pharm 2009;1:317-21.